It’s not only Christmas time that you and I stand in need of simple, wholesome ideas for filling gift baskets to present to friends and family. All year long there are occasions where just the right combination of homemade flavors will take an ordinary day and turn it into an occasion. I had the pleasure of reviewing Kathie Lapcevic’s book Gift it From Scratch recently and I had to pass on some of what I learned to all of you. 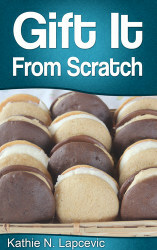 Gift it From Scratch is a simple e-book that takes the reader along on a culinary journey of how to cook for gifting. Typically, if I’m going to give edible delights to my neighbors, I limit myself to cookies. Cookies are great, don’t get me wrong. 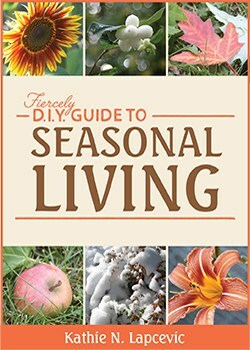 And there are certainly cookie recipes in Kathie’s book (hello, Chocolate Malt Cookies), but there’s also so much more. For one thing, there’s Kathie’s wisdom – I enjoy reading her prose. The idea of gifting food isn’t new, of course. Gift baskets don’t have to be baskets, either. Sometimes a brown paper shopping bag will suffice if it’s full of fresh popped popcorn or some of Kathie’s Whole Grain Crackers. Cooking with five children wears me out, though, and by the time I get to the gift basket part, I’m pooped. Never fear, I tell myself, because there’s Kathie’s common sense – we don’t need to spend huge amounts of time or break the bank to create lavish gift baskets. Simple is better, less is more. One of my favorite suggestions in From Scratch is to bring over soup with homemade potholders and leave the potholders as a special gift! Kathie suggests thrift store finds and simple crafty enhancements to finish out your gift baskets but, of course, the point of any gift basket is the gift itself. When those gifts are homemade in your real woman or real man kitchen, they are, as Kathie says, priceless. From hearty soups to wholesome breads, each recipe is created using nourishing ingredients that you most likely already have in your cupboards. There are recipes to make ahead and freeze, those you want to deliver piping hot and some that may not make it out the door because they’re so tempting. Case in point, we wanted to try Kathie’s recipe for Glazed Maple Walnut Bread; we were thinking we’d slice it, wrap it in parchment paper and take it to a neighbor whom we haven’t seen out and about in awhile. Um, we ate it. Every last crumb. We still have the basket and the parchment paper and homemade tags to dress it up so we’ll try again and see how far we get next time. I bet we at least make it to the driveway. With Kathie’s permission, I share her recipe for that delectable Glazed Maple Walnut Bread. Yes, I am shamelessly trying to lure you in – can you smell the hot maple? For a printable, adjustable, fancier version of this recipe, click here. Preheat oven to 400 degrees. Grease two mini loaf pans. Sift together the flour, baking powder, and baking soda. Set aside. Whisk together the milk, maple syrup, egg, and melted butter. Pour into the flour mixture and stir until the batter is moistened and a bit lumpy. Fold in the chopped walnuts and mix completely. Divide the batter between the two pans and bake in the preheated oven 25 to 30 minutes, the top will be a golden brown and an inserted toothpick will come out clean. Allow to cool in the pans for 5 minutes before removing to cool completely on a wire rack. Once the loaves are completely cool, drizzle with the maple glaze* if desired. See below for melted maple glaze. I have a favorite book I read from time to time; it’s a favorite of my children, too. Tasha Tudor’s, A Time To Keep , is all about the rhythm of a life lived close to the earth and the hearth. Peace comes to us when we can anticipate the pattern. We find joy in the ice of winter because we have experience with the fact that it will give way to spring. God gives us His own kind of peace through the patterns He’s created for us in nature and in the home. These rhythms give me comfort and joy. Authors like Tasha and Kathie help me find both. I’ve been scared to try that bread – afraid I’ll eat it all by myself. I need to make sure all my kids are home before I make it. Thanks so much for sharing at Simple Lives Thursday; hope to see you again this week.